Instead, Conner was the 25.8 pick in rookie drafts during the 2017 offseason. This was a result of a strong rookie draft class and his status behind LeVeon Bell on the Pittsburg depth chart. During rookie drafts, Conner was the type of RB who did not have standalone viability in lineups. In any week Bell was active, Conner projected to be a pure backup who would not make your fantasy lineup. This is a contrast to 2018 rookie Nyheim Hines, who projected to have a role as a receiving back early in his career. Being “buried” on the bench along with the strong rookie class pushed Conner almost a full round below where he historically projected in rookie drafts. “I think a lot of how I think about the world is searching for fat tails and outsized outcomes. And the difference in call it the payout, the payout of a very low likelihood event and what that means…the payouts are enormous.” Former Philadelphia 76ers GM Sam Hinkie. Given all the pieces in his profile, Conner was an easy buy above his ADP. He was a recommendation of mine in rookie drafts in the mid-2nd of rookie drafts and I accumulated a greater than 60% ownership of him across my leagues, the highest of any player. There were multiple “outs” where Conner’s could make his hand. A Bell injury in 2017 or Bell signing with another team in free agency in 2018 were clear opportunities for Conner to be a lead back in Pittsburg. 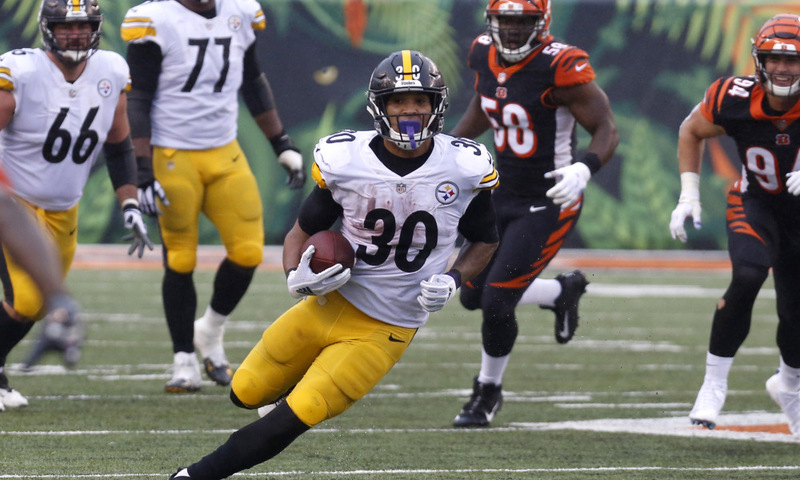 Even if Bell re-signed with Pittsburg, a Bell injury would have presented an opportunity for Conner. The current situation with Bell refusing to report to camp was not an expectation in the spring of 2017 but fits with Bell’s free agency concern. Conner’s profile is more impactful than a profile like Hines because there is both clarity and upside. Conner was more likely to produce no starter valuation than Hines but was also more likely to produce clear-cut starting opportunities than Hines. If there was a week Bell would miss, Conner was a clear starter, whereas Hines was less likely to land in a clear starter situation. Before the season, I would have projected Conner to be about 80% of Bell’s 2017 output. In 2017, Bell had a 1.68 regular season wins over replacement players (WORP – Note: I used weeks 1 through 13 for WORP for reasons I describe in detail in my book). Bell’s WORP ranked 2nd at RB last season behind only Todd Gurley who produced 1.75. (Incredibly, Gurley produced an additional 1 WORP in week 14 through 16, basically a full season-long win in a three-week span.) Through week 9 last season, Bell produced 1.05 WORP. This is basically found money. Even an optimistic Conner owner would not have expected this level of production. He is on pace for over 2 WORP through week 13. The numbers could vault up this season with Gurley (1.94), Alvin Kamara (1.58), Saquon Barkley (1.49), Kareem Hunt (1.34) and James White (1.34) all at or ahead of the pace for 2 WORP through week 13. Conner’s was not the only high-level “handcuff” RB entering the season. T.J. Yeldon, Latavius Murray, Rod Smith, and Spencer Ware were other quality options with high upside. To date, both Yeldon (.76) and Murray (.36) have been meaningful fantasy options while Smith and Ware remain an injury away. Conner is the best example of the reward in investing in high-level backup RBs. While some will advocate investing in handcuffs to your stars, being aggressive with high-level backups where you do not own the starter has an opportunity for a big payoff. They may not get an opportunity to produce, but when they do, they can change your team’s fortunes. If you stack similarly situated RBs on your roster, the injury rate at the position will present opportunities for starter weeks during the season. Given Conner’s rookie ADP, his highest expected WORP through his first 3 seasons was .12 WORP. He’s on pace to produce almost 20 times that expectation. The WORP numbers of ADP are largely efficient on average, but there is high variance. Conner was a high variance pick with the large possibility of negative WORP, but his 2018 production is a reflection of the rewards of embracing the fat tails of low likelihood events.